Last night a friend told me she doesn’t talk much by phone. She communicates mostly through internet and e-mail. In fact, she’s in seminary and her classes this quarter are all online. I could so relate! I don’t talk by phone much either. Socially that is. Professionally I spend workdays talking on the phone with attorneys to troubleshoot computer problems. Like my friend’s classes, my job is “all online” or virtual. I don’t see my clients or co-workers in person. We had something else in common, too. She told me she was checking voicemail messages. I used to be. It was a thorn in my side for years… until I found the perfect solution. I told my friend what solved my voicemail woes, and she liked the idea. That’s when I thought I should blog on it in case others out there are struggling with the same problem. For obvious reasons, it’s important to check voicemail messages in a timely manner and respond to them. For one, the message may be urgent. Your child’s school may call, or the doctor’s office. A friend may be in crisis. There’s a number of urgent messages that you don’t want to get around to checking a week or more later. Besides all that, it’s just color-box common courtesy to get back to people. So what’s my perfect solution? Grasshopper. 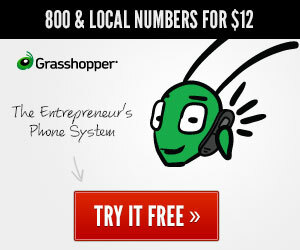 Grasshoper is a virtual phone system that works with your cell phone (or land line if preferred). This phone system has of numerous benefits. I highlight the top seven below in relation to my (perhaps unorthodox) way of using their service. Calls Ring My Cell First. I configured my T-mobile cell phone to ring 3 times before forwarding the call to my Grasshopper phone system. (I can set the number of rings to anything I want.) Most cell phones have this option under “Call Settings” or “Call Forwarding Options.” Activating this feature causes my missed calls to go over to my Grasshopper voicemail system instead of my cell phone voice mailbox with T-mobile which I’m horrible at checking. Voicemails Come to E-mail. Inside my online Grasshopper account, I set my account to automatically send all calls to voicemail. (It can also be setup to ring any phone number of your choice.) The reason I send all calls to voicemail is because all the calls are ones I didn’t answer on my cell phone. Once a person leaves a voicemail, it comes to me in e-mail! This feature alone is a lifesaver. To boot, I can play the message right from my e-mail. I have a folder or “label” inside of my G-mail account called “Voicemails.” The folder lights up (turns bold) whenever I have a new voicemail. Mailbox Options. You can setup unlimited mailbox options at no extra cost, if desired. “Press 1 for June. Press 2 for RLW Fitness.” You get the idea. You can record a main greeting and even record unique greetings for each mailbox if you want. You can record the greetings by clicking the “record” button inside your online Grasshopper account, or simply upload an MP3 file. You can even upload your favorite songs as hold music. Text Message Alerts. In addition, I setup a “filter” (message rule) inside of my G-mail so that my incoming voicemails also forward to my phone as a text message. That way if I’m not at the computer to instantly listen to the voicemail, I can still play it on my cell phone. The text message contains a play button that allows me to listen to the message. This isn’t really Grasshopper-specific but it’s part of my overall setup. Retain Copy of the Voicemail. Receiving my voicemails inside my e-mail account as attachments also allows me to “forward” them to others to hear. For example, I may want to delegate a task to someone else. It also makes it easy to save treasured messages from family members or others. Toll-Free Number or Local Number. You can give people a toll-free number to call you. This doesn’t matter as much these days since most cells can call long-distance for free, but I find it to be a nice option. You can also secure a local number if you prefer to have a number that uses the area code of your local area. Receive Faxes. Don’t have a fax machine? You can use this service to receive faxes too, that are then forwarded conveniently to your e-mail inbox as attachments. Now that’s nice. I’ve used Grasshopper for years now, back when it was known as GotVMail, and I highly recommend it. In preparation of this blog post, I joined their affiliate program so that I can offer anyone wanting to try it $50 off. Pretty groovy, eh? This year I aspire to be more purposeful about sharing helpful resources in my arsenal that may bless others! I told another friend today that God knit me to be resourceful. It’s like I can’t help myself! I’ve got to connect people with helpful resources or other people. Hence, The Urban Web Link (for those of you who know what that is–which I aspire to rebirth when the time is right). So there you have it. If you’re “voicemail challenged” like me, Grasshopper can help! As far as talking more on the phone goes, this wife and mommy of an active four-year-old who has a full-time job and does freelance web design and blogging on the side is working on it!